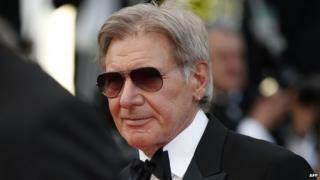 Harrison Ford's left leg was broken in the injury he suffered while shooting the new Star Wars film, the US actor's publicist has confirmed. It was previously believed the 71-year-old had broken an ankle in an incident involving a door at Pinewood Studios on 12 June. "His surgery was successful and he will begin rehab shortly," continued Ina Treciokas in a statement. "He's doing well and looks forward to returning to work." Ford, who is reprising his role as Han Solo in Star Wars: Episode VII, was airlifted to John Radcliffe Hospital in Oxford after the accident. The BBC understands he was injured while filming a scene involving a door on the Millennium Falcon, Solo's beloved spaceship. Last week a spokesman for the Lucasfilm production company said the actor had "sustained an ankle injury" and shooting would continue while he recuperated. A spokesman for Thames Valley Police confirmed officers had been called to the studio in Iver Heath, Buckinghamshire, just after 17:00 BST following reports of a man being injured in an incident involving a garage door. A spokeswoman for South Central Ambulance Service said they were called to an incident involving "a door that had fallen". Ford is among a number of original Star Wars cast members who are working on JJ Abrams' film, set for release in December 2015.